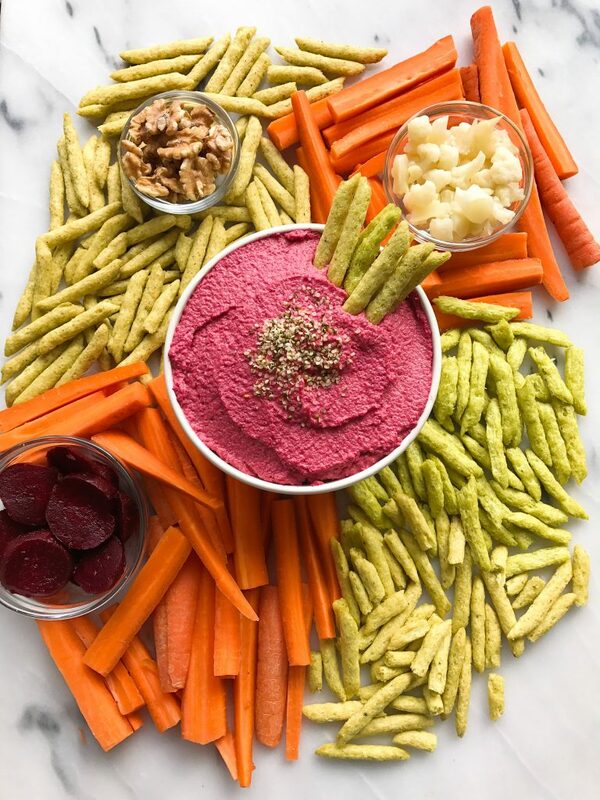 Chickpea-less Beet Hummus made with no beans, no oil for an easy and yummy plant-based dip! I loveeee my chickpeas. Like more than one likely should be loving their chickpeas. Hummus, falafel, chickpea pasta, in a salad, roasted, you name it. I also am lucky my body seems to react well to chickpeas too and I don’t get stomaches or anything, but that doesn’t seem to be the case for many. 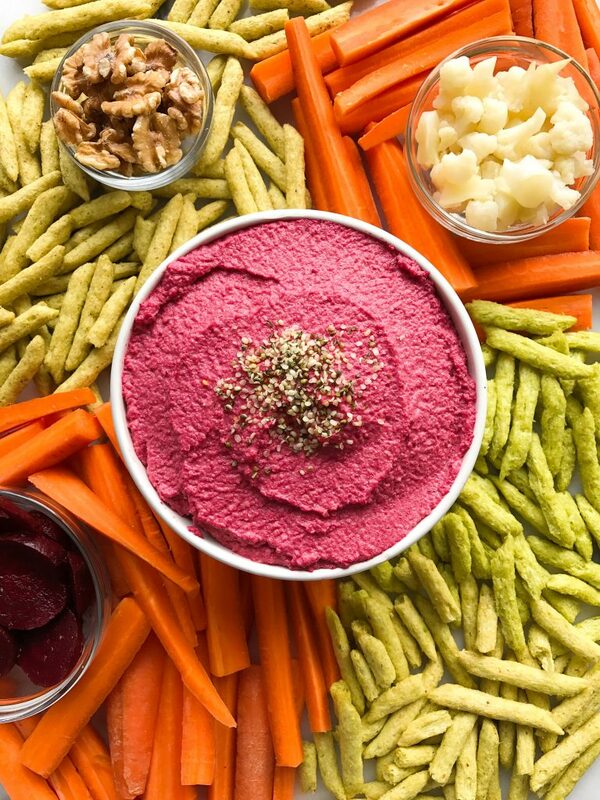 For anyone who does not tolerant chickpeas well, this Chickpea-less Beet Hummus is for you. And if you love your chickpeas, you will still love this creamy flavorful spread. There is NO oil added in here either, so helllllooo that is shocking. 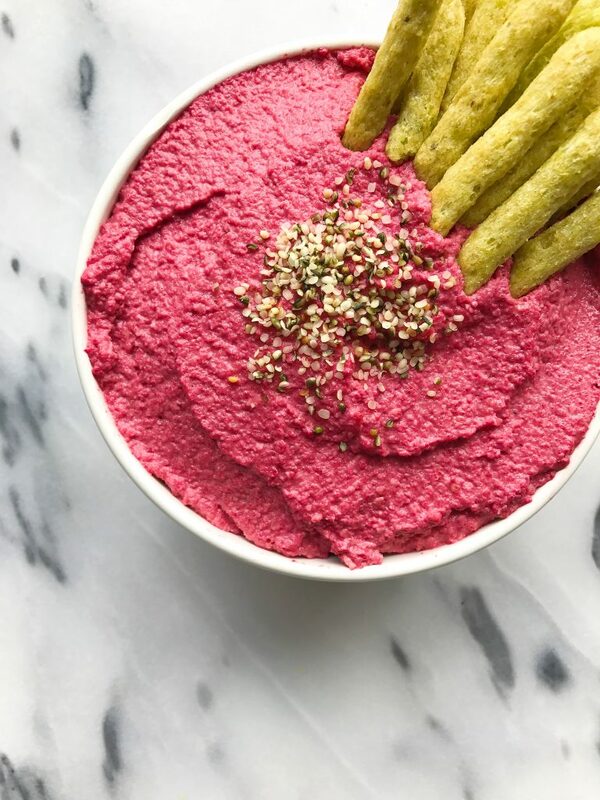 Filled with cauliflower florets, cooked beets, garlic and more, this chickpea-less hummus is SO easy to make and it is the best dip to pack for work, make for a little dinner party or just smear on your sandwich or use as a salad dressing. 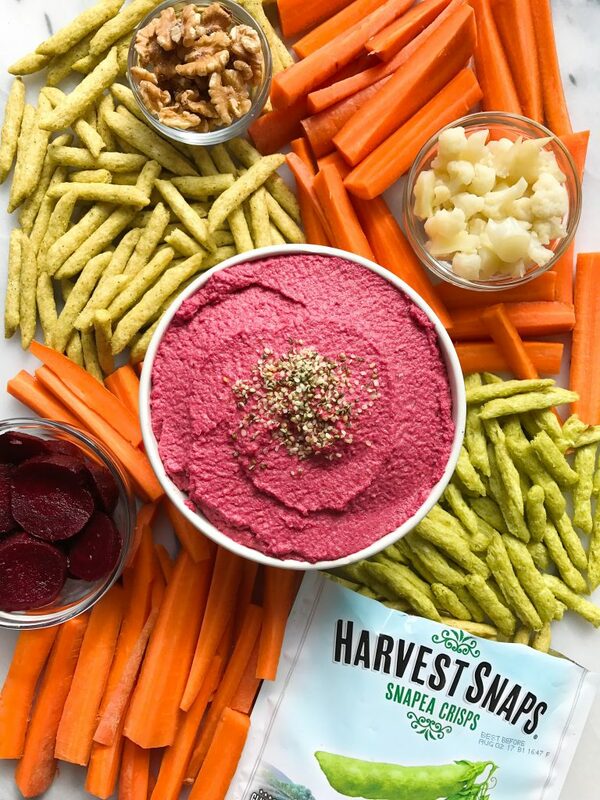 I personally love dipping Harvest Snaps Snapea Crisps in this dip because the flavor combo is unreal. Like try not to eat an entire bag in one sitting, I dare you. They are a staple in my pantry and Jord brings them to work and all his co-workers go crazaaayyy! They are high in protein compared to most savory snacks and they are gluten-free and even have a solid amount of protein and fiber. My favorite are the lightly salted and black pepper but you seriously can’t go wrong with any. Plus they even have lentil brand AND black bean crisps! I also love using their products instead of croutons in my salads for an extra crunch (remember this Crunchy Green Goddess Salad with Tahini Dressing? so good). Enjoy with Harvest Snaps Snappea Crisps, Lentil Bean or Black Bean snacks! Thank you Harvest Snaps for sponsoring this post. It means so much to me to work with brands that I love and who support rachLmansfield! This is beautiful Rachel! It caught my eye on Bloglovin’ and I just had to tell ya. SO smart to use cauliflower instead of chickpeas!!! Such a clever idea, Rachel! cauliflower is legit the most versatile and amazing veggie of all time! This beet hummus is super pretty and tastes amazing I’m sure! Can I use the love beets packet? Just made this tonight, Rach! I’ve been looking for a bean-less hummus substitute FOREVER. I roasted the beets to give it some of that roasted flava. LOVE.